It just makes sense. Especially when eating real foods that powers us… Eat what is in season. 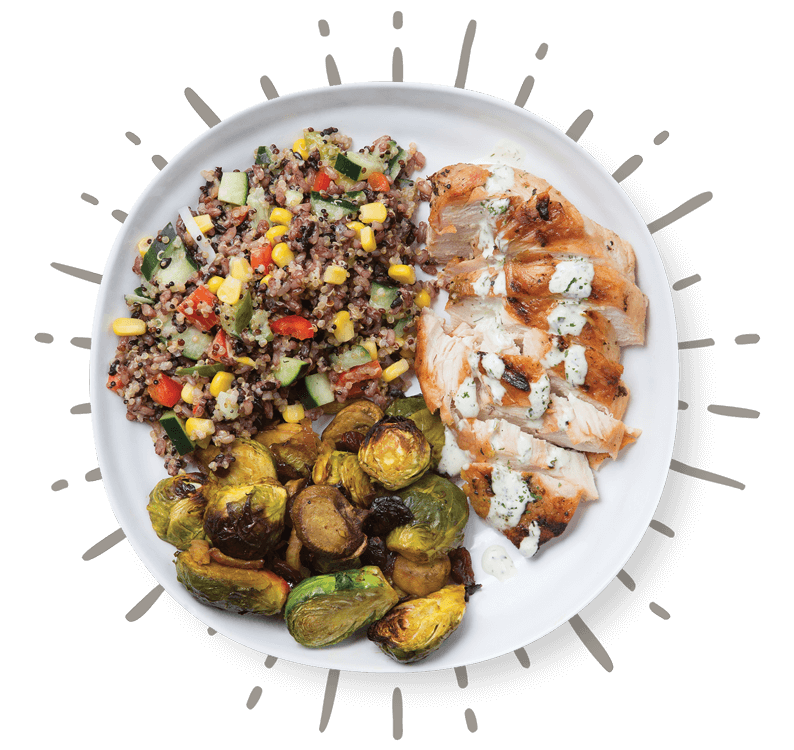 At CoreLife Eatery, everything we prepare starts as real, whole food and we focus on the best, freshest available. That means that we work with those around us to find the foods that are at their peak. We look for organic and GMO-free. Even the bones that we simmer every night are sourced from organic farms. We want to reflect a new way of thinking about food – a practice of sourcing that fuels the body and the soul. 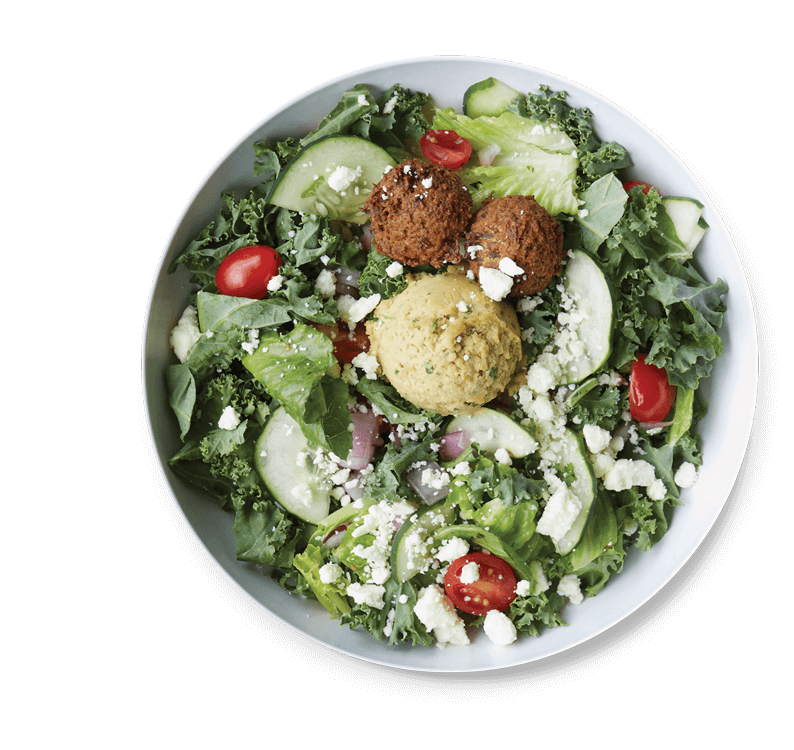 Dark leafy greens, your bowls choice of veggies and scratch made dressings. Eating clean and green at its best. 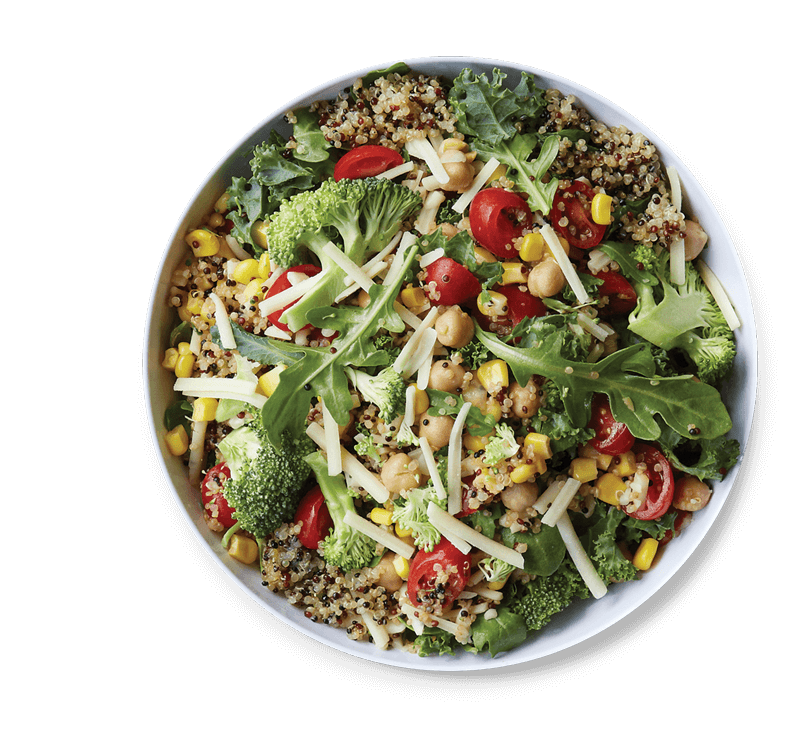 Warm organic whole grains are at the center of these nutrient dense bowls. 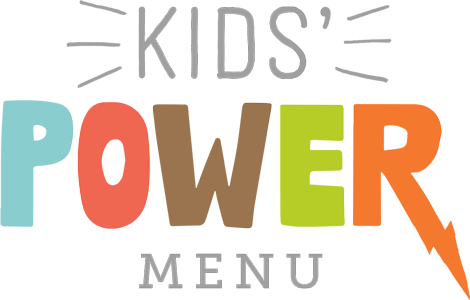 Power up your day! Meals in a bowl. We slow simmer our bone broths in store all day, every day. on its own, a 12 oz.  or 32 oz. cup of steaming broth for the sipping. Go beyond the bowl. Choose a high quality protein grilled to perfection, add a filling side, select a house roasted vegetable medley, and top it off with one of our scratch-made sauces. When a kale salad just won’t do. Spicy & flavorful! 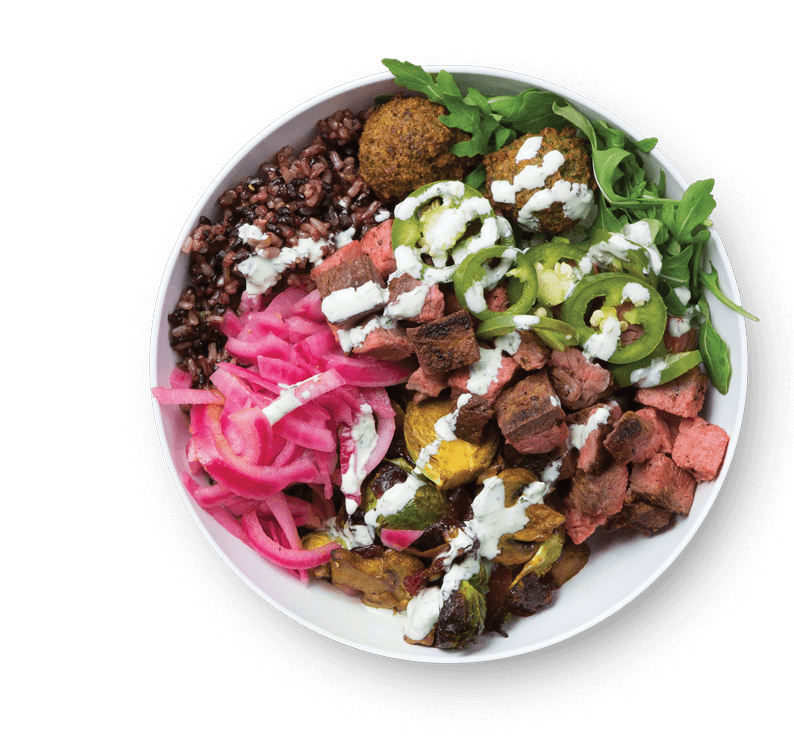 – these filling combinations are designed to satisfy…inventive, interesting flavors stacked into a bowl with warm, sticky purple rice. kale, arugula, mesclun, napa cabbage. Grains: Tri-colored quinoa, purple rice blend, rice noodles. Jalapeños, corn, spicy broccoli, beets, sprouts, peppers, red onions, cucumber, tomato, scallions, carrots, celery, chickpeas, peas, black beans, dried cranberries, edamame, Sriracha sprouts, shiitake mushrooms, ginger, Kalamata olives, pickled red cabbage, pickled jalapeños, pickled red onions. Feta cheese, gorgonzola cheese, cheddar cheese, mozzarella cheese, parmesan cheese, avocados, bacon, parmesan crisps, egg, roasted tofu, falafel, antibiotic-free chicken, grass-fed steak. Broths: Beef bone broth, chicken bone broth, vegetable broth. Dressings: Balsamic vinaigrette, carrot chili vinaigrette, citrus poppyseed, cranberry vinaigrette, cucumber basil, thai cashew, greek yougurt caesar, greek yogurt bleu cheese, lime cilantro jalapeno vinaigrette, miso sesame ginger, sriracha, extra virgin olive oil, fresh lemon squeeze, fresh lime squeeze. 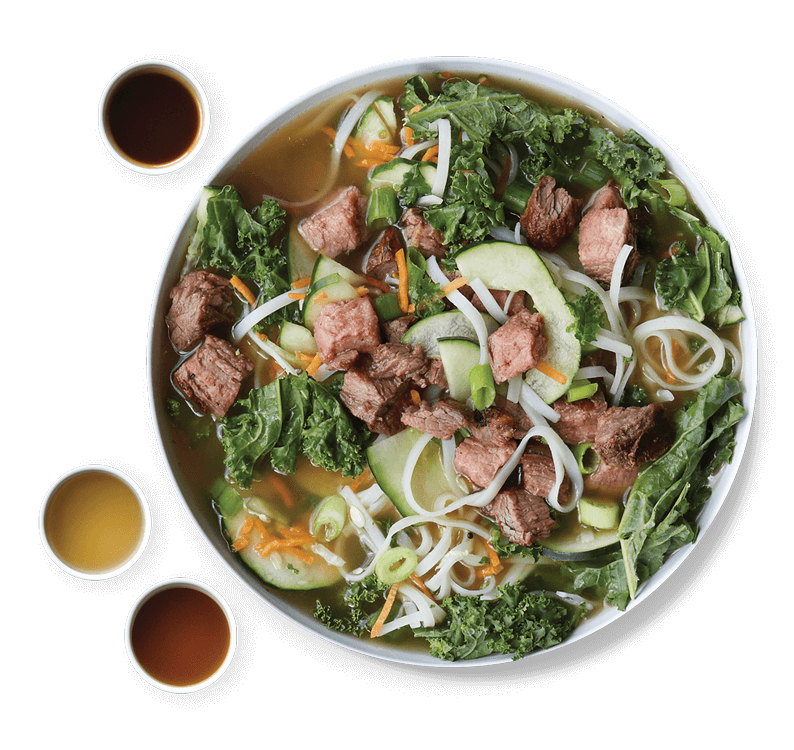 Why stop at healthy, power-packed bowls? If we can juice the carrots that make our dressings so good, why not squeeze fresh lemons right here too? And we think that great tasting teas, lemonades & coffees can make people really happy!